Here are some tips and tricks to make the rewarding task of caring for your dog just a tiny bit easier. 1. If you have a hard time brushing your dog's teeth, squeeze some enzymatic doggie toothpaste onto a Nylabone or rope toy and let your pooch go to town on it. 2. Make your own pill pockets when you need to feed your dog some medicine. 3. Learn how to make your own chicken jerky. It's a healthier alternative to the store-bought kind. Get the directions here. 4. A carabiner is a quick and easy way to leash your dog. 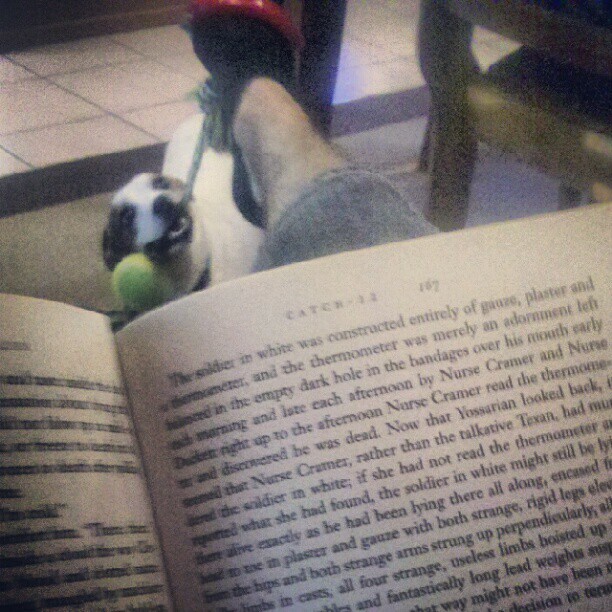 Put a rope toy around your foot. 6. Use baking soda to get dog urine out of carpet. If you don't happen to have a product like Nature's Miracle on hand (maybe you're traveling or at a friend's house), pour some baking soda over the spot, let it sit, and then sweep or vacuum it up. 7. Put a ball in your dog's food bowl if he or she eats too fast. They'll be forced to move the ball around to get to all the food. Once your dog has removed all of the fabric from the ball, you can stuff the scraps right back in! 9. If your dog isn't feeling well, add some low-sodium chicken broth to the drinking water. 10. To remove pet hair from upholstery, dampen a rubber glove and run your gloved hand over it. The latex/rubber will attract the hair. 11. Use a teapot to rinse dogs off in the bathtub without getting water and soap in their eyes. 12. 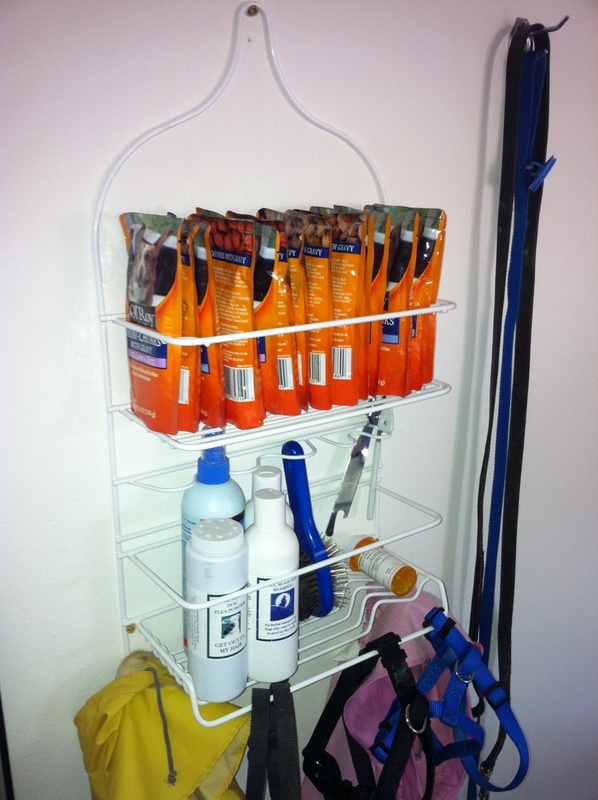 A shower caddy makes a great storage solution for all your doggie stuff. 13. Use a plastic pitcher to store and dispense dog food. It takes less time and keeps the food fresher. I use the MUJI rice storage dispenser, which comes with a handy measuring cup. 14. If you've got a teething pup who loves destroying cords, spritz bitter apple spray onto a paper towel and wipe the cord with it. This covers more surface area and wastes less product than simply spraying the entire thing. 15. Make an ice lick by freezing toys, bones, and chicken broth into a cake mold. 16. Invest in an escape-prevention harness if you have a small dog and a fenced-in yard. A little silly looking, but it's safer than risking a runaway dog. Buy it here. 17. 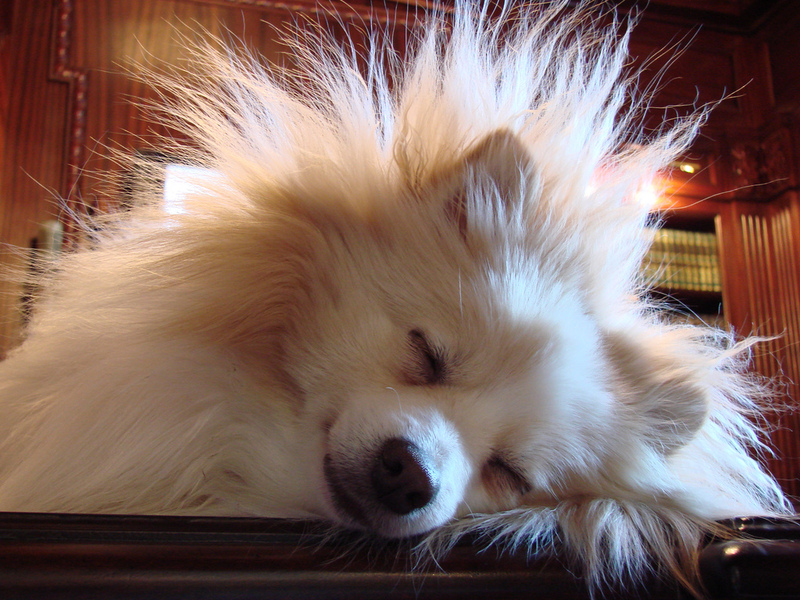 Run a dryer sheet over your dog's fur when there's a storm — chances are, they aren't freaked out about the storm but the static electricity built up in their fur. According to Martha, this should work at least 50% of the time. 18. On a hot summer day, fill up an inflatable pool with water and ice. 19. Make a dog-walking station for the entryway if you have more than one dog. See how this is done here. 20. Dilute your dog shampoo to make it last longer and easier to apply. Fill the bottom of an empty shampoo bottle about ¼ inch. Fill up the rest slowly with warm water. 21. If you have a small dog, cutting up a lamb roll into tiny pieces is a cost-effective way to make healthy, bite-sized training treats. A 1-pound roll costs $6.98. Cut it up into the desired size, store most of it in a ziplock bag in the freezer, and leave the rest on the counter for immediate use. 22. Make your own hammock-style car seat cover. The hammock style keeps the dog from getting hurt if he or she falls during any sudden stops or starts. Get the pattern here. 23. 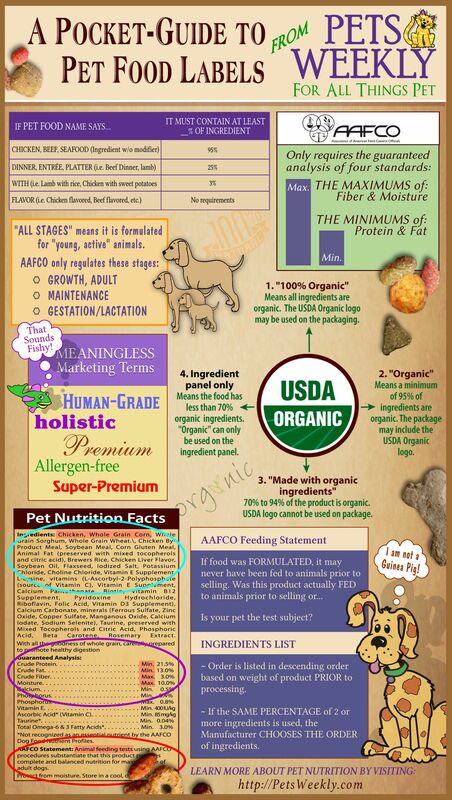 Print out and keep this handy chart of what foods your dog should NOT be given. 24. Make your own flea shampoo. 1 cup Dawn, 1 cup vinegar, and 1 quart of warm water. Massage in and let it sit for five minutes. According to one testimonial, "The fleas just floated in the water and died and best of all little Libby did not have any reactions at all to the process." 25. For easy tick removal, apply a glob of liquid soap to a cotton ball and swab the tick with the cotton ball for a few seconds. The tick should come out on its own and be stuck to the cotton ball when you remove it. 26. Remove pet hair from carpet with a squeegee. 27. An inexpensive and easy summer treat for dogs: Cut up apples in chicken broth and freeze in an ice cube tray. 28. If you have an older dog with tooth troubles, add a little water or chicken broth to his or her kibble and microwave for 20 to 30 seconds. This softens the kibble and makes the food much easier to chew. 29. Teach your dog to file his or her own nails by attaching sandpaper to a piece of wood. Apparently, dogs can be trained to use a scratching post just like cats! Get the directions for how to build a giant dog nail file here. 30. Read your dog's body language. 31. Sprinkle parsley on your dog's food for fresher breath. 32. Here's an ingenious leash that has a built-in waste-bag dispenser and a compartment for keys, cards, phone, and treats. 33. Instead of buying special Kong stuffing, stuff a Kong with cheese cubes and place in the microwave for five seconds. The cheese will melt just enough to stick to the inside of the Kong. 34. Turn an empty pancake-syrup bottle into a portable squirtable water bottle. 35. It's certainly unpleasant to take your dog outside when it's snowing or raining, but don't forget that dogs' paws are just as sensitive to heat as human skin. On hot summer days, walk your dogs before 9 a.m. or after 8 p.m. — or walk them only in shady or grassy/dirt areas. 36. Have an extra kitchen drawer? Use it as a dog food holder. 37. Print out this guide and bring it with you when dog food/treat shopping. 38. Possibly the best use of old jeans ever: a lap pillow. Stuff an old pair of jeans with stuffing to simulate a human lap that smells just like you!